iPhoto for iOS has a great feature that lets you wirelessly beam pictures from one iOS device to another, this means that if you’re editing a photo on an iPad you can immediately send it over to an iPhone and vice versa, without ever leaving the app. You will need Location Services enabled to use beaming with iPhoto, this is usually on by default but can be turned on quickly through general iOS Settings > Location Services. 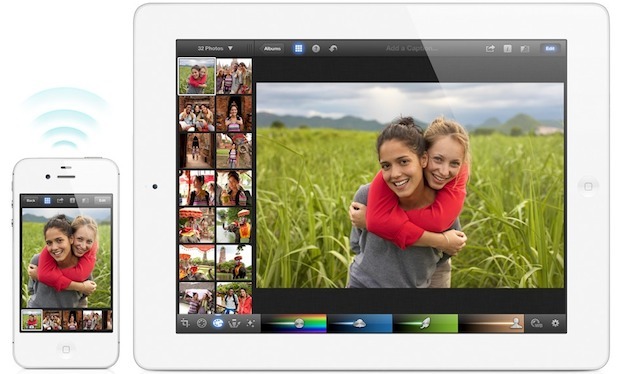 iPhoto isn’t the only way to move pictures between iOS devices though, with iCloud enabled and Photo Stream, pictures taken on one device will appear automatically on each device using the same iCloud account, and pictures can also be sent through iMessage or a group of photos can be sent with email. The latter two options also work to send pictures between iOS and OS X, though preferably a future version of iPhoto for Mac will include the same beam option. If you don’t have it, iPhoto is $5 on the App Store and comes as a universal app, meaning the same version will run on all compatible iOS devices. personally I think this feature needs to go beyond iPhoto and be included in Photos. Think of it like AirDrop for pictures. And if I do that, all the iPads in my neighbours’ apartments will ask their owners if they want to receive my photos as well? So, I’m assuming this is only for the newest iPad(3)? I’m assuming this is only for iOS devices in the same wireless network. Am I correct? I’d like to beam photos to my aunt 500 miles away, can I do this? Or do we need to be on the same iCloud account? I do not see the gear icon you refer to. I’ve rolled back to iPhotos. Couldn’t find a way in Photos to load my pics onto my old iPhone 4 running IOS 7.1.2. Assuming you have to use iCloud to do this. Don’t want to upload my stuff to the “Cloud”.